Well, think again. 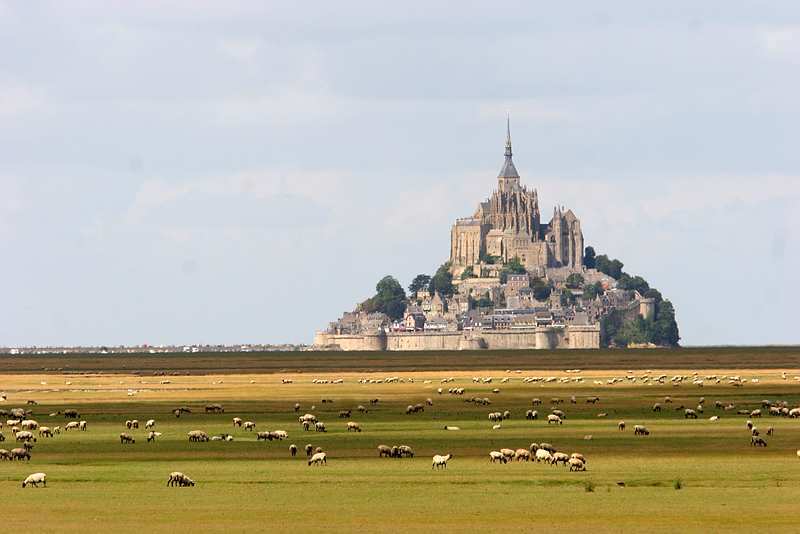 In particular, I put up that great photo of the NW France offshore cathedral/monastery Mont-Saint-Michel (credit: Olivier Boitet) for a reason, mainly to ask you to add some windmills to the picture with your imagination, and see what you think then. For that is precisely the news we get from a local French newspaper called Ouest-France (to which I was referred by an article in Le Parisien): windmills are coming, so it seems, to the Bay of Mont-Saint-Michel. Wait now, don’t get too upset yet, consider this: first of all, there will only be three of them – but each will be 99m tall, and combined they will be able to put out 6.6 Mwatts max. Furthermore, they will be placed about 10km away. Still, we’re talking about a panorama on the ocean here (review picture above); clearly, they’ll be unavoidably visible in certain views of the island. “Do you want to put a night-discoteque around Mont-Saint-Michel?” That comment comes from one Jean-Louis Butré, president of the Sustainable Environment Federation (Fédération environnement durable or Fed), an organization trying to prevent installation of the windmills (by the energy company Epuron – French, of course, any foreign company’s application to despoil a jewel of the French patrimony this way would be rejected out of hand, EU or no EU). Unfortunately, the legal permission to do so has made its way successfully up the French court hierarchy; all that remains is for the appeal to stop it to be heard by the Council of State, France’s “supreme” court. However, just like the US Supreme Court, the Council could simply refuse to do so, in which case the lower-court ruling (i.e. “Go ahead”) stands and there won’t be anything left for the environmental protestors to do – legally, at least. Then again, the protestors may have a trump-card, in that they claim that installing the windmills could move the UN cultural agency UNESCO to remove the island from its World Heritage list. (Indeed, that seems to be the main concern of the journalists covering the story: some variation of “Will it be removed from the UNESCO list?” makes up both articles’ headlines.) And it seems they may even have something there and are not just blowing smoke: the World Heritage committee in its latest meeting (in Brazilia) demanded that the French government show that it intended to “conserve” the shrine by 1 February. (Whatever that means; anyway, that’s my interpretation of the text that the committee a demandé de la France «un état de conservation» du Mont-Saint-Michel avant le 1er février.) It will meet again after that (in Bahrain) to evaluate the government’s response, and possibly proceed to de-listing.